It is bad enough for two sisters to love the same man, but when they end up married to the same man at the same time, drama is sure to follow. Jacob was no ordinary man: He was a twin, his mother Rebekah’s favorite, and destined by God to become the father of the tribes of Israel. Though he is called “mild” in Genesis 25:27, he was devious—a trait that would come back to haunt him. He and his mother tricked his twin Esau out of his birthright and his blessing. A brother’s love turned to hatred, kindling a desire for vengeance and murder. At Rebekah’s fearful insistence, Jacob fled for his life. As a herdsman skilled in tending and breeding cattle, he had no penchant for the chase like his brother. Now he found himself in Haran seeking sanctuary from Laban, his uncle, until Esau’s anger cooled. He moved forward, pushed the rock aside, and helped Rachel perform her daily ritual, introducing himself as her relative. Scripture does not say what Rachel thought as she ran to her father with news about the stranger/relative who assisted her. However, it does record Laban’s jubilation as he welcomed his sister’s son. It also records Jacob’s reaction to this young woman who was “beautiful in form and appearance.” He loved her (Genesis 29:18), and wasted no time in offering a proposal of marriage. 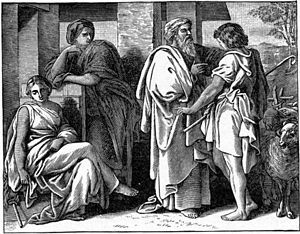 As Jacob had plotted with his mother to deceive Isaac, it is likely that Laban conspired with his elder daughter, Leah, in matters of matrimony. The custom of the land dictated she be wedded first, but Laban had a problem. His firstborn did not meet the beauty standards of the day. Commentators offer a mix of reasons: Leah had blue eyes. She had cow eyes (her name means “cow”). She was teary-eyed from crying so much. I like Clarke’s assessment of her chief recommendation—her “soft and beautiful eyes.” Rachel, however, had the whole package—a fine face and a fine figure. Laban realized he could have the best of all worlds and with a little finagling, marry both Leah and Rachel to the same man. Great People of the Bible and How They Lived suggests at the time he only had daughters, and marriage to Jacob would assure a capable son-in-law to take over the family holdings (Reader’s Digest, 1974, page 54). Jacob worked diligently for seven years to pay off the bride price. The night finally arrived when his beloved entered his darkened tent, her face hidden behind the traditional veil. Only the harsh glare of morning’s light revealed the cruel trickery: It was Leah, not Rachel, who occupied the marriage bed. Jacob demanded an explanation to which Laban calmly offered a practical solution: Work seven more years, and he could have them both. A week later, Jacob had not one but two wives, and faced a long stint of labor in order to satisfy another bride price. Now his challenges really begin.